Dear friends, Our Israel office reports that after so much recent political action and turnarounds in Israel, the last two weeks have seen a remarkably quiet period of the election campaign. The deadline has now passed for parties to submit their lists, so internal position jockeying has ended; but national campaigns have not yet begun in earnest. The elections are now just over one month away, and the pace of campaigning will certainly pick up as of the beginning of January. While there has been some considerable movement in polling numbers, the overall “blocks” remain the same. The right continues to poll around 65-68 seats, and the center-left around 40 - 42, plus a further 10 for Arab parties. These numbers have barely moved since the elections were announced. At least 61 seats are required to form a government. What has changed, has been movement within these overall blocks. 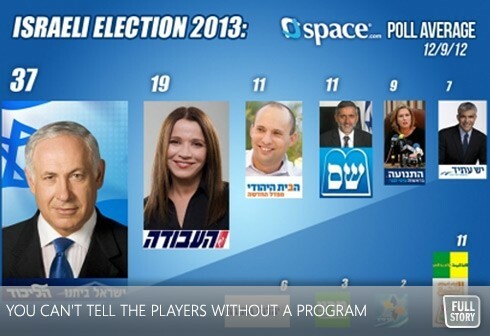 The Right On the right, Likud-Beitenu has been losing ground. In the current Knesset the two parties have 42 seats, but latest polls predict them winning just 35 (which is still considerably more than the next biggest party, Labor, on 19). In many ways, these numbers show the wisdom, from a Likud perspective, of Netanyahu joining his list with Yisrael Beteinu, even though this may translate into less seats. Had the agreement not been made, the current number of 35 would be split, with Likud appearing as just 25, representing a fairly small gap for Labor to close. At the same time, Yisrael Beteinu’s leader, Avigdor Leiberman, quit his job as foreign minister when the DA’s office announced that they would indict him for a fairly minor corruption charge. Far more serious charges against Leiberman had been investigated for many years, but the DA decided, ultimately, to drop these. Leiberman remains party leader, and claims that he will “clear his name” in time to serve again in the new government. The most likely scenario is a plea bargain on a minor offence that will not preclude Leiberman from serving in public office. The rising party on the right is the Bayit Hayehudi (Jewish Home), formerly known as the National Religious Party. Currently polling as the third largest party, it’s new young leader, Naftali Bennett (whose parents made aliyah from the US), has effectively tripled his party’s numbers. Both major ultra-Orthodox parties, Shas and United Torah Judaism look set to maintain their current numbers. Two smaller right-wing parties currently as if they will just make it in to the new Knesset: The far-right Otzma Leyisrael as well as Am Shalem, led by former Shas MK Rabbi Chaim Amsalem. Am Shalem is positioning itself as a moderate ultra-Orthodox party that promotes a more liberal stance to issues such as conversion and encourages haredim to serve in the army and to work for a living. oth Livni’s new party and Yair Lapid’s “Yesh Atid” are neck and neck, holding their ground in recent polls; as is the more left-leaning Meretz party. The three Arab parties seem likely to maintain their current strength. Silverman is the President and Chief Executive Officer of The Jewish Federations of North America.